Are you tired of your local air? If so, a bag of atmospheric gases from Williamsburg, Brooklyn, could be yours if you have thousands of dollars to burn. This week, a sandwich-sized ziploc bag surfaced on eBay’s historical memorabilia section under the listing, “Air from Williamsburg, Brooklyn! HIP COOL BROOKLYN LENA DUNHAM 11211” (condition: used). 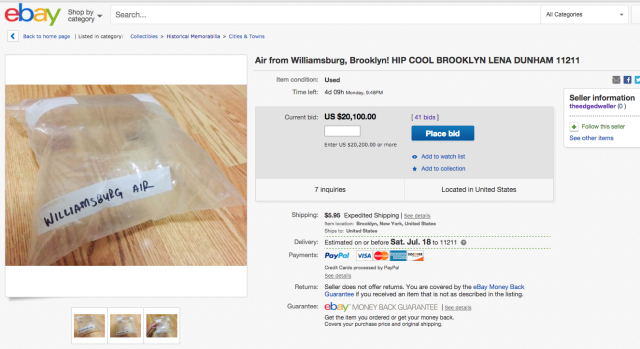 What you are bidding on here is a sample of air from the COOLEST neighborhood in the world… Williamsburg, Brooklyn! 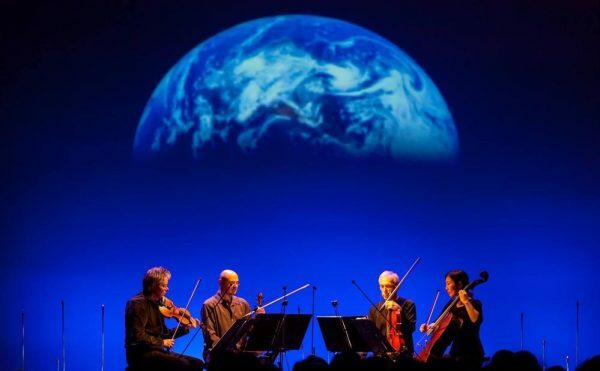 The air was collected in the summer of 2015 and the mystery oxygen could’ve come from anywhere–perhaps it circulated at our trendiest bars and brunch spots like Enid’s or the Wythe Hotel. Or maybe it spent some time on the set of Lena Dunham’s hit HBO show, ‘Girls.’ It could’ve even been breathed in by our hippest resident celebrities like Sky Ferreira. That store on Bedford Ave. that sells only fedoras? The hot sauce store on Wythe? We’re not saying! There’s truly no telling where in “The Burg” this air came from! Tourists travel from all over Europe and Asia to photograph this air in our very cool thrift stores like Buffalo Exchange and Beacon’s Closet. Here’s your chance to own some. It makes a perfect gift for that hip trendsetter in your life or a conversation piece to decorate your luxury loft. Don’t miss out. With so many multi-million dollar waterfront condos going up, this might be your last chance to afford air from this much coveted zip code (11211). Air can be shipped either in a Ziploc bag or in a mason jar from one of our many, many mason jar speciality shops. After 2014 brought news of Airbnb performance art and the unforgettable eBay sale of a screenshot that sold for $90K, we can only reason that someone will soon come clean and announce “Williamsburg Bag” (2015), polyethylene plastic resin, air, fast-drying ink, Internet as a visual critique of gentrification and post-Internet art, or whatever. When that happens, the listing will be another example of the stream (flow?) of air art, which dates back to the early 20th century: in 1919, Marcel Duchamp purchased an ampoule from a pharmacist, whom he had empty of its liquid and fill with air. He then pasted on its surface a label that read “Serum Physiologique,” creating “50 cc of Paris Air.” Thirty years later, the vial broke but was restored, introducing the mystery of whether or not its contents remain true to the unwavering promise of its printed label. More recently, in 1999 the late Tobias Wong stood at the intersection of Prince and Greene streets in SoHo for his “dreams” project, selling 50 bags of air in sizes “S, M, and L.” He priced the sacks, which represented his dreams, at a dollar each, creating a tableau of a young, aspiring artist simply trying to get by in New York City. Echoing Duchamp’s work but with more political overtones, last year Beijing artist Liang Kegang brought home a jar of clean air from Provence — also labeled “Air in Provence, France” — to protest his city’s staggeringly high levels of air pollution. Like Wong and this most recent Brooklyn vendor, he auctioned it off and earned 5,250 yuan, or nearly $850. 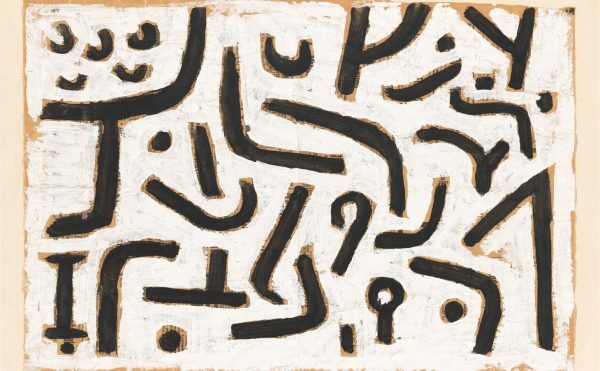 UPDATE, July 10, 11:15 am ET: The listing has been removed for reasons unknown, three days before the auction was scheduled to end.